Yesterday the BBC reported that radiation levels at the crippled Fukushima reactor site are ten million times normal levels. As the oceans near the damaged nuclear plant are becoming contaminated with increasing amounts of nuclear radiation, concerns are growing about how much radioactive poison the planet’s seas can withstand. 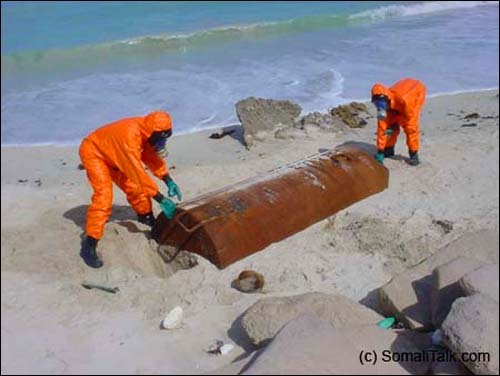 However, although it is not receiving anywhere near as much attention as the unfolding disaster in Japan, the massive amounts of illegally dumped radioactive nuclear waste that are still being thrown into Somalia’s oceans potentially could prove to be an even more deadly catastrophe. For decades members of organized crime syndicates and other western companies have been freely dumping tons of radioactive nuclear waste into the unregulated shores off Somalia’s coastline, poisoning the seas and devastating the local population. Somalia has not had a functioning government for many years; the scores of rusty leaking hazardous waste tanks that have been washing up on their shores prove just how many criminals have been exploiting the nation’s inability to protect their own waters. “…As soon as the government was gone, mysterious European ships started appearing off the coast of Somalia, dumping vast barrels into the ocean. The coastal population began to sicken. At first they suffered strange rashes, nausea and malformed babies. Then, after the 2005 tsunami, hundreds of the dumped and leaking barrels washed up on shore. People began to suffer from radiation sickness, and more than 300 died. “…the toxic dumping, which includes highly radioactive nuclear waste, was destroying the fragile coastal ecology and the livelihoods of hundreds of thousands of Somalis. Some residents in Mogadishu’s coastal areas already reported hundreds of dead fish washing ashore every day. During the height of the Somali civil war, Swiss and Italian firms Achair Partners and Progresso, signed a secret agreement with the transitional government of warlord Ali Mahdi Mohamed. Taking advantage of the chaos and the fact that Ali Mahdi was desperate for arms and cash to oust rival General Farah Aideed– the European firms began to unload thousands of tonnes of toxic waste arriving in steel drums off the coast of Somalia. Some even made it to the mainland and were buried in 40 inches by 30 inches holes. The main perpetrators are said to be Italian firms controlled by the mafia, whose job is to dispose Europe’s extremely hazardous waste. Locals also suspect German and Danish shipping companies are in the trade, with some contracted to transport thousands of tonnes of poisonous stockpile including 60, 000 hexachlorobenzene (HCB) barrels from Australia. They say, sometimes instead of taking the hazardous waste to Europe where it can be incinerated, they dump it in the Somali coast to save money and time and also they face strong opposition from Europe’s environmental action groups. It seems tragically ironic that so much care and attention are being focused on the recent nuclear catastrophe in Japan, yet absolutely nothing is being said or done to protect millions of Somalis who have been poisoned for decades by our illegally dumped hazardous nuclear waste. Who are the real criminal pirates here?